When performing an inspection for a new customer, many times the homeowner will point to where they “know” their septic tank is located only to have us discover it’s somewhere else on their property. A septic tank’s location cannot be verified until the lids are exposed — a visual inspection just isn’t enough. This sure was the case with a home in Timberwood Park. The area is notorious for having deep tanks, as well as having tanks installed in a different location than the permitted plan indicates. After being unable to find the septic tank using a metal detector and probe in the homeowner’s yard, we brought in our trusty transmitters — small, flushable devices that enter the tank and send off a signal we can pick up over the ground. 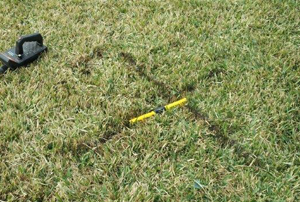 We found the signal exactly where the homeowner said the tank should be; however, we inserted our three-foot probe all the way into the ground and could not feel the tank (the X in the picture above marks the spot of where the locator stopped — the yellow part is the handle to the top of the three-foot probe that is in the ground). Since we had already spent quite a bit of time trying to locate the tank, at this point it was more cost-effective to have a mini-excavator uncover tank lids. We finally found the tank about four feet down; after exposing the lids we were able to continue with the inspection and pumping, as well as install septic risers to help avoid this problem in the future. Because the tank was buried down so far, Texas regulations state that it should already have had a riser that brought the lid to within six inches of the surface of the ground. What appears to have happened in this case, and in many similar cases, is that the tank may have been buried about one foot down at the time of its installation, but later a homeowner or landscaper brought in more soil to level out a slope in the yard. It was a hard lesson for the homeowner — who was trying to sell his property — but the buyers were glad they opted for the full septic inspection instead of a visual inspection. If we had merely run the water inside the house and checked for wet spots in the yard, the buyer would have purchased the home not knowing what trouble was in store the first time they pumped out their tank! Do you know where your septic system is? If you’re not sure where your septic tank is located — or if it’s been more than three years since you had it pumped and cleaned — it may be time to schedule a full inspection. We’ve been servicing and installing septic tanks for more than 75 years. Give us a call at 830.249.4000 (Boerne) or 210.698.2000 (San Antonio) for professional, friendly septic service!